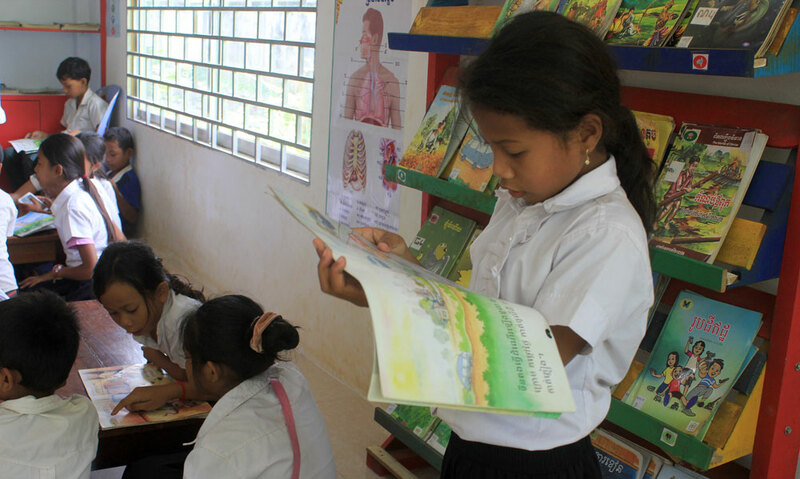 Although there have been recent improvements in the reading proficiency of Cambodian children since the completion of an overhaul of the national curriculum in 2010-13, overall reading scores continue to be unacceptably low with a national World Bank report in 2014 indicating more than 25% of children are still reading below standard. Because reading is a foundational tool skill that affects performance in all other subjects, the failure of the education system to achieve high reading proficiency in the early grades sets the stage for poor academic success in later years. Hence, KAPE proposes to promote early grade reading through a system of interventions that provides a ‘total’ reading approach that moves beyond the classroom to include other elements in a child’s learning environment including enhanced library services, support from other students. KAPE believes that a ‘total’ approach to reading can address these challenges in a way that allows for more differentiated approaches to meet all children’s needs. The Total Reading Approach for Children (TRAC III) aims to promote the children acquire essential early reading skills through an approach that focuses on the totality of the child’s learning environment including classroom learning and assessment and parental reinforcement. Doing baseline and end line of EGRA test for target and control schools to see the progressing of reading proficiency. Peer tutoring which can help the slow learners learning from their peer.